Vault ConversionsDo it right, do it once. Guaranteed! We have completed dozens of this type of project throughout London and skills in this area are probably second to none. We design, plan, construct and complete making us a unique one stop shop! Victorian and Edwardian vaults exist in many London properties and provide hugely profitable opportunity for development. These often over looked and underused areas when converted have provided our clients with bedroom, kitchens, bathrooms, studies or simply valuable dry storage. The vault's internal walls can be removed to create a large room and a link created that attaches the new habitable room to the main house. Often an entrance door is fitted to the lightwell and the new room can have a window to the lightwell too. Even listed buildings normally permit vault conversions provided the internal arches are kept. In these cases increased head height to a minimum of 2.4m is achieved by structural underpinning of the perimeter walls and lowering of the floor. Occasionally it is possible to remove the arches this permits a flat roof and reduces the need for deep underpinning. 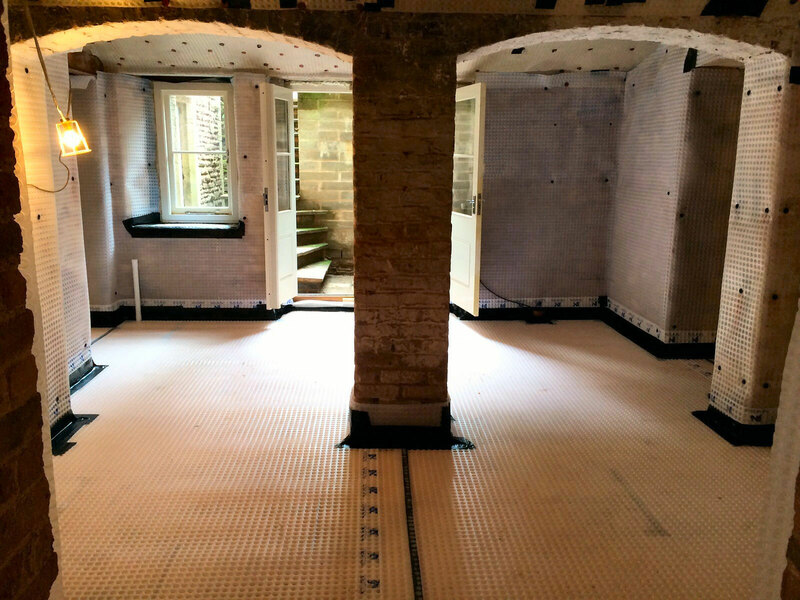 The whole area is fitted with a membrane system walls, floor and ceiling together with a dual ground water removal and foul water removal pump system should the area be fitted with a wc. Tanking with waterproof render can also be an option for less wet vaults or for dry storage areas. Planning Applications will almost certainly be required and the whole project is done under building control notice. Where structural works are carried out party wall awards will need to be in place. We offer a complete and package so you don't need to manage anything! Waterproofing Guarantee Installation 10yrs insurance backed.